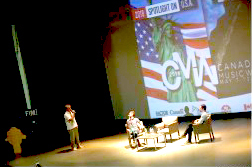 Neill Dixon, project manager for CAAMA and president of Canadian Music Week (CMW), along with Jean Philippe Sauvé, a member of SODEC, a Québec government company under the Minister of Culture and Communication, presented a talk at Cineforo about the relationship and musical interaction between Canada and Mexico. The Canadian music market sustains wide areas of opportunity, especially in priority markets such as Toronto, Montreal and Vancouver, cities with the largest number of Latin American and Hispanic-Canadian immigrants, Mexico with the first place of resident inhabitants, followed by Chile and Colombia . Neill anticipates this year at Canadian Music Week where Canadians can access opportunities with foreign markets, and build bridges working with government agents and associations outside Canada to help bands access new music market.s In 2018 the link will be with Mexico, United States and American bands. The lecture offered an ideal opportunity for CAAMA to present a video to pre-promote the upcoming Focus on Mexico at CMW. CMW is a business gateway to make contacts and deals, a good opportunity for foreign music groups, especially for the Mexican music industry. Jean-Philippe explained one of the biggest challenges for Latin American groups is the lack of familiarity with groups who do not translate their music into English or French (Canada’s official languages), however, when the music is original and different, it will always have an enthusiastic audience who will want to listen to them. SODEC has programs to export artists from Canada.